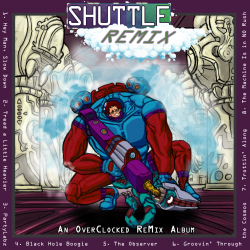 DaMonz: Shuttle Rush is the first game that I developed with my team, Takusan Works, and Shuttle Remix reinvents the game's whole original soundtrack. This album was made by an amazing OverClocked ReMix strike team. They all did an outstanding job at reworking the game's music into something entirely different. Every arrangement is enjoyable in its own way, and brings a whole new set of colors to the soundtrack. In contrast with the somewhat hyperactive original music, most of these arrangements are relaxed and groovy, all in their own way. And even though the album might seem slightly short, it shows one of OverClocked ReMix's greatest strengths: diversity. Every ReMixer has their own style, and this album makes no exception. I am extremely grateful to every single one of them for their awesome work on this album, and I hope you will all have a great time listening to it! 1. Theory of N - "Hey Man, Slow Down"
2. DDRKirby(ISQ) - "Tread a Little Heavier"
4. halc - "Black Hole Boogie"
5. Phonetic Hero - "The Observer"
6. Amphibious - "Groovin' Through the Cosmos"
7. DjjD - "Trottin' Along"
8. DDRKirby(ISQ) - "The Machine Is in NO Rush"
Sources: "Rush for Your Life," "Race Against the Machine"